Last month, we shared an excerpt from a book about garden and backyard foraging, called “Harvest”. 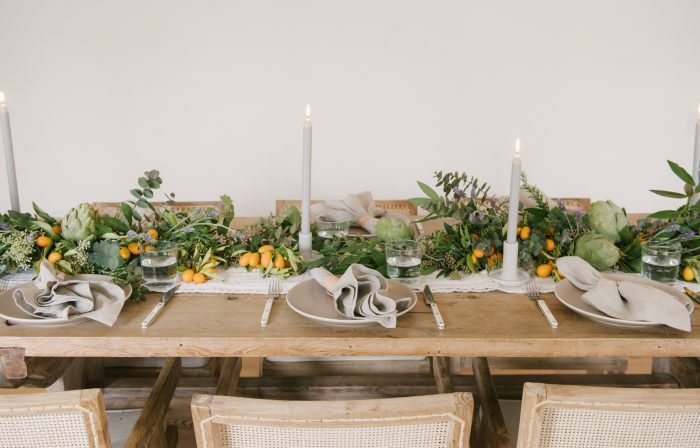 Another title on the topic that I’ve been very inspired by lately is called “Foraged Flora: A Year of Gathering and Arranging Wild Plants and Flowers”. 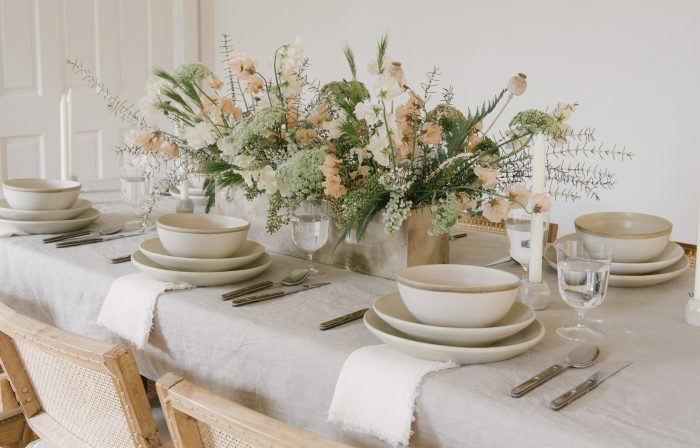 It was published last fall by Ten Speed Press and was put together by artist and floral designer Louesa Roebuck, Sarah Londsdale, a co-founder of Remodelista, and photographer Laurie Frankel. Louesa splits her time between Los Angeles, Ojai, and the Bay Area with her textile-designer partner, Curtis Fletcher. 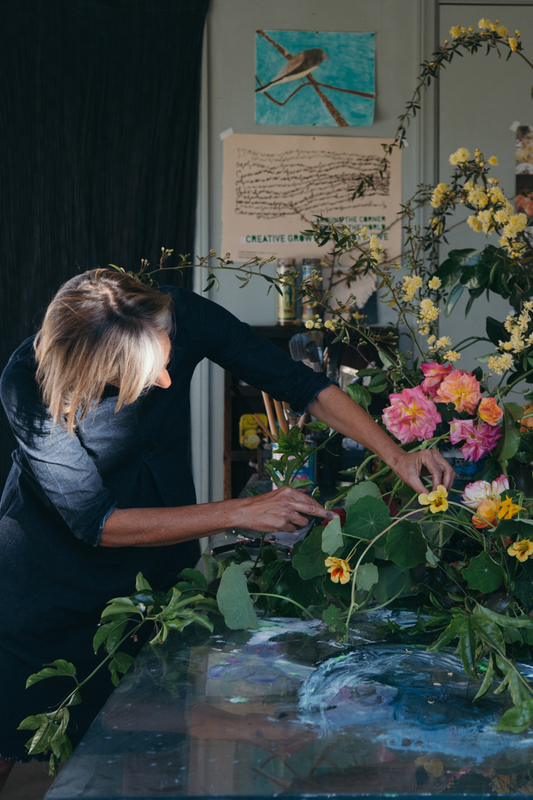 Louesa has experience in the worlds of food (at Chez Panisse) and fashion (with Erica Tanov) and now works as a painter in addition to creating floral arrangements for the likes of Vivienne Westwood, John Baldessari, and Alice Waters. She is an artist in every sense of the word, and an incredibly talented one too. 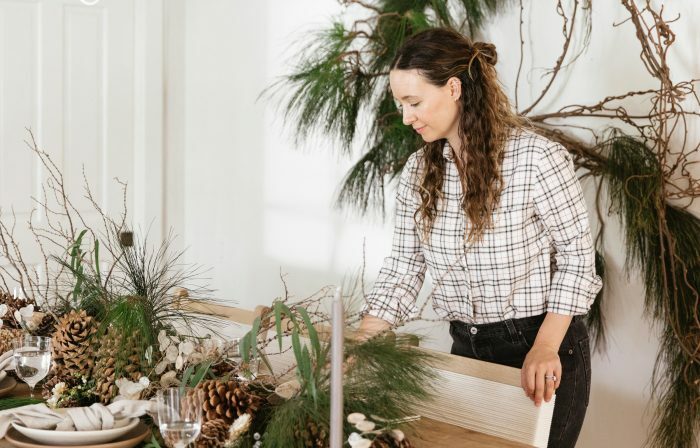 Not only is her resourcefulness when it comes to floral design impressive, but her wild, sprawling, and vibrant displays will take your breath away. Rip & Tan: You’ve had a dynamic career, working in several different creative industries over the years. 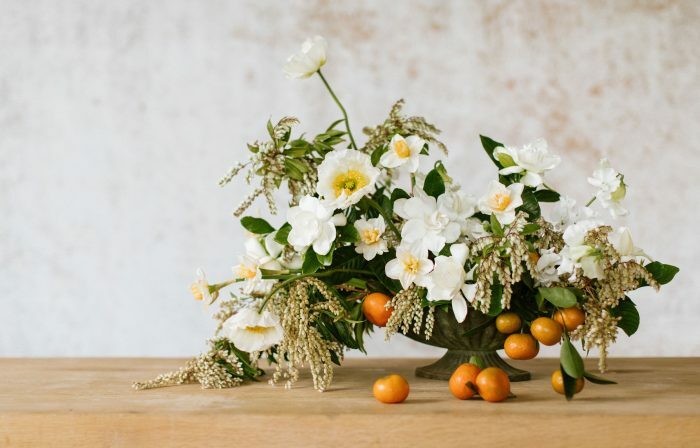 Can you talk a little bit about your professional path and how it eventually led you to floral work? 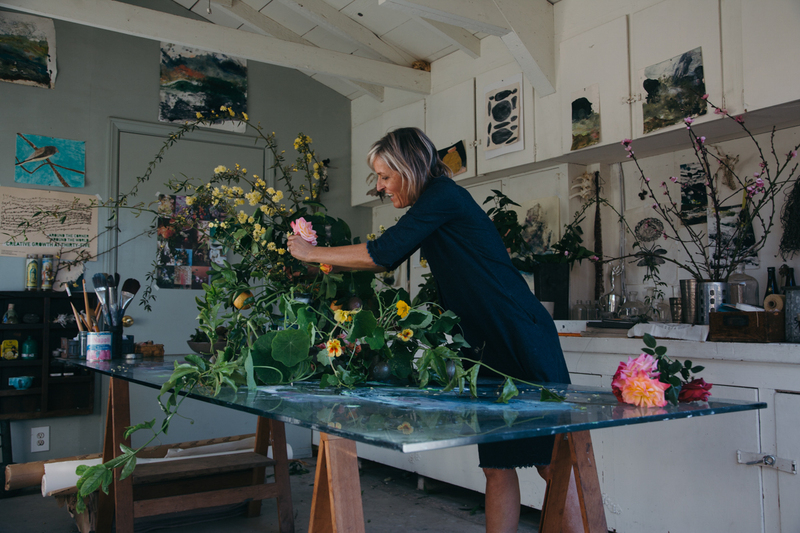 Louesa Roebuck: I have been extremely fortunate during my life in California; enjoying endlessly inspiring work cultures and environments, all with an exacting standard of craft and beauty. Always a mx of the wild and the organic with a little bit of discipline. I’ve worked with visionaries like Alice Waters, the fertile community of Chez Panisse, Erica Tanov, Todd Selby, Sylvan Mishima Brackett of Rintaro, and Laurie Krantz of Edible Gardens—all people who truly value creative culture and environment. All of my endeavors have been small in scale on purpose, socially and environmentally conscience, and observant and respectful of nature. As Neil Young says, “It’s all one song”. Rip & Tan: How did you know when it was time to make a change in your career or transition to a new project? What helped you overcome the fear of the unknown when embarking on a new chapter? LR: I closed my shop and community art hub in August of 2009; a time when many smaller, more independent and I think interesting businesses closed due to “the big short”. I simply kept doing the foraged and gleaned flora work I had always done. 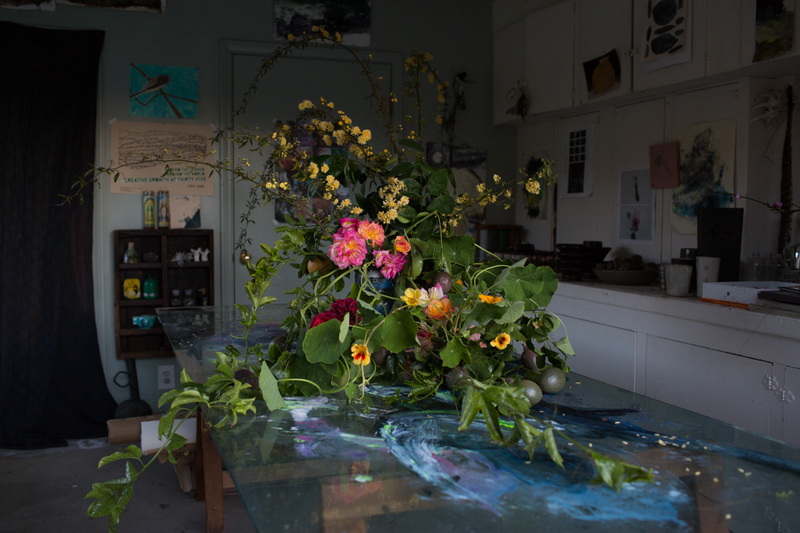 My 2000-square-foot shop gave me a larger environment to experiment with larger and more conceptual floral installations, and people responded to the work. My Chez Panisse community brought me back into the fold a little and supported the Foraged Flora work. 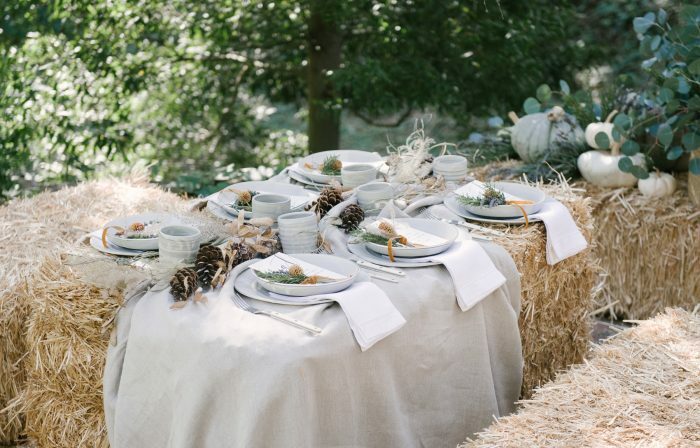 They understood the work because it was an extension of all they stood for; working in season, relying on foraged or gleaned ingredients rather than engaging with agribusiness. We had the same ethos; slow food, slow flowers, slowing down and observing and relishing nature. 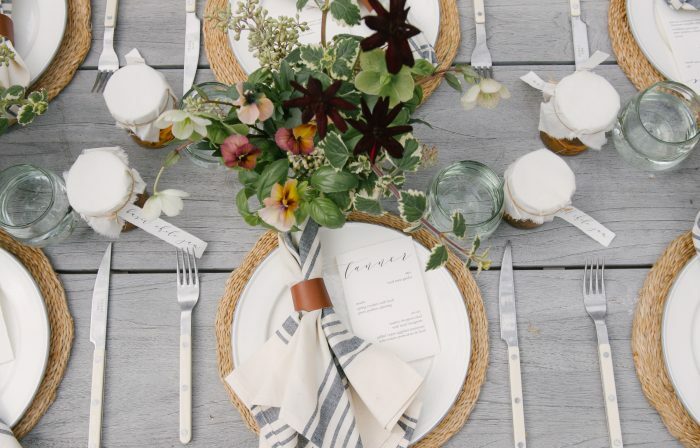 Rip & Tan: Have you always loved floral foraging/arranging? What experiences helped you discover the craft? LR: Yes! But never in a conventional sense. I believe all of our experiences lead to and feed our craft. Rip & Tan: What is your typical work day like today? 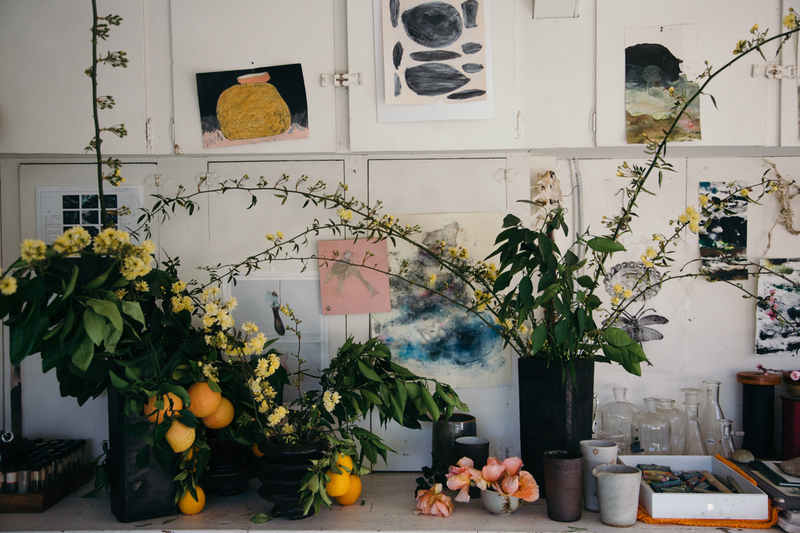 How do you divide your time between SF and Ojai and florals versus your painting work? LR: We don’t really have a typical day, except that every day begins with green tea with avocado honey, or in the winter sage honey, chocolate, and meditation in bed. Then there is no blueprint. Curtis and I usually have several creative projects going at any one time. 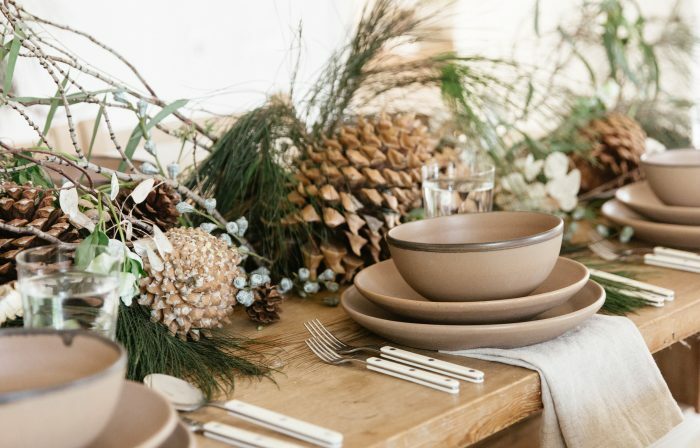 Right now we are still very focused on Foraged Flora and continuing to have events to bring its message and beauty into the world. It was a true slow work of art; 3 years creating and now bringing it to new communities since October 2016. We’re also working on design and branding for our new home textile line, called Neem. It’s a collaboration between us in Ojai and our partners in India. I paint every few weeks, in short-ish intense bursts after some fallow time, looking and thinking. Rip & Tan: What drew you to Ojai and/or your studio space specifically? LR: Who in the world wouldn’t be drawn to Ojai?! It’s paradise. All of the natural beauty we need and crave, a warm creative community, a middle-class still, and close to LA-LA. Plus, we have a cute modest house with his and hers studios! Rip & Tan: What’s your perfect day in the studio look like? What do you listen to/eat/wear and what do you accomplish? LR: For me honestly, it’s just perfect to have a light-flooded, indoor/outdoor studio with little views of the TopaTopa mountain range. I’m super thankful for it, and sometimes I just sit in the studio with my dog Scrap and my tea looking around thinking. I’m writing this interview sitting here now and it calms me to be in this space. In terms of my style, I’ve always been androgynous and a bit of a tomboy. My shop, August, was intentionally androgynous. I’ve always loved textiles more than fashion. I like things that are a little beat up and vintage-looking. And I buy things that I believe are well crafted and will LAST; beyond it being on-trend, I want something and can take some hard use. Most of my clothes are still from the era when I had a shop’ beat up Acne jeans, RTH drop crotch army pants. I like a good old fashioned tank. I’ve been wearing Erica Tanov’s denim Rye dress often. It’s well-made, stretchy, and has pockets, which is always helpful. I’m a hippie who was a child in the ‘70s so I listen to a lot of what that conjures that era. Neil Young, Roberta Flack, and Chaka Khan sounded good to me the other day. Curtis likes older hip hop and angrier stuff, and I like that mix. Vintage reggae sounds sweet to me lately, too. Rip & Tan: Can you talk a little bit about the arrangement you put together for our shoot? LR: Everything came from Ojai or Carpenteria, and was foraged or gleaned 1-3 days before we shot, some that same day. The Lady Banks roses have been glorious the past few weeks, so they were a star to me. Huge long canes full of tiny roses—what more could you ask for?! Nasturtium from alongside the road near a creek bed in Carpenteria. I think nasturtium is perfect and sublime in every way—and the entire plant is edible. I also added some slightly tacky roses from my yard; I didn’t plant them but they make me smile. Oh, and a few roses from my friend Anna from Cattywampus Crafts! Also, passion vine and fruit and citrus on the branch with white heavenly scented blossoms. 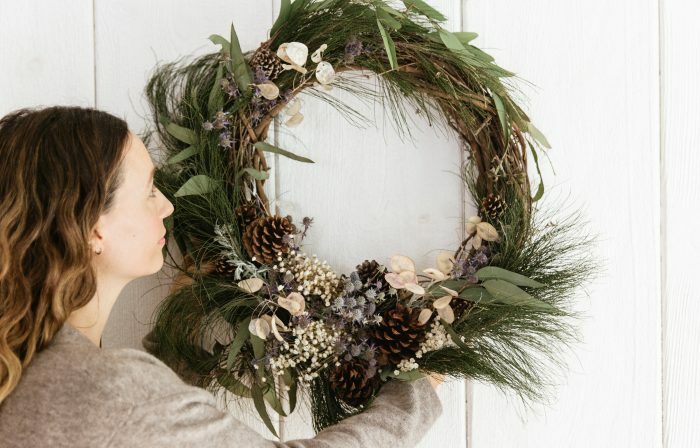 Rip & Tan: What tips or advice do you have for folks out there who don’t know much about foraging or arranging but appreciate florals and want to give it a try? LR: I think to begin by deeply observing the natural environment around you. See what’s sprouting, blooming, thriving and also perishing and learn and be inspired from that observation. Deep looking and thinking will lead to more love and understanding. Move away from pristine bloom obsession; avoid uniformity at all costs! Don’t be afraid to define your own look and style and don’t be shy about asking your neighbors if you could cut something that’s overgrown. Adopt don’t shop! That’s a dog rescue joke (another passion of mine) but it holds true in many areas of life. Rip & Tan: Where do you find inspiration as an artist and creative person? What is inspiring you these days? LR: My biggest source of inspiration is mother earth, and all of her creatures, critters and diversity, and genius. Sounds corny but it’s true. My love of nature drives all the work. My little pack inspires me and make me laugh, which is so needed these days. I’m into Leonora Carrington. This past year, Bruno Munari, Frank Zappa, I don’t know, I think these lists should be long and different every day! Rip & Tan: What do you like to do in your free/personal time? What are you looking forward to doing this summer for fun? Rip & Tan: Do you have any goals for your career or company that you still hope to accomplish? LR: I hope to be a woman artist of some note before I die at 92 or something like that. Sadly quite a feat still, but I’d like to have a show at Hauser, Wirth and Schimmel, or create an install for the grande dame Vivienne Westwood again but larger. Or make another book that’s slightly scary and funny in a magical realism manner. And mostly be kind and expansive, while I’m being creative. To think less and make more.